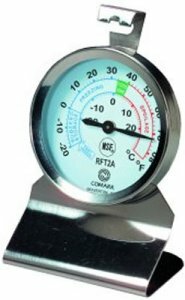 Made from stainless steel with an easy to read dial, featuring a coloured quick reference temperature guide, our Comark Dial Fridge/Freezer thermometer will allow you to store food safely whether at home or in the workplace. Simply stand the thermometer in your fridge or freezer or hang from one of the shelves to monitor safe temperatures at a glance. This is the second one purchased for a friend. Product arrived promptly. Well packaged. Dispatched very quickly. Excellent product. Seems to be accurate.